The TV Ratings Guide sitcom ratings sitcom scorecard Week 26-27 Sitcom Scorecard Happy Hour Order: More Nielsen Mudslides, or Certain Renewals? Week 26-27 Sitcom Scorecard Happy Hour Order: More Nielsen Mudslides, or Certain Renewals? An exciting feature was added to the table, informing readers of overall seasons, episodes, and record high and low ratings. A grateful citation is in store to TVRG's friendly competition, spottedratings.com, for 8 years of retained records to help enrich the Sitcom Scorecard's information. The added information shines a perspective on a show's durability and shelf-life. A 32nd Sitcom entered the ratings arena -- NBC's Trial and Error, which emerged toward the delta of "The Middle of the Pack". Given 34 shows will premiere before May Sweeps, criteria for the Scorecard's three classification is updated to reflect the changes. Anticipated springtime drops lowered the "Winners" classification's delta to a 1.40 rating, previously required a 1.50 rating to enter this elite classification. This paved an opening for CBS' ever sturdy Mom to finally emerge in the classification's delta, creating 11 positions. The Middle of the Pack lost one position, as two existing shows moved into other classifications and Trial and Error entered marginally above the delta. Family Guy once again leads the Watershed position of this classification, as well as Last Man Standing returning to the Middle of the Pack's Delta. The Anemic classification gained another displaced tenant, as Bob's Burgers dropped below the Middle of the Pack's minimal 1.10 Delta, now leading the Anemic range's Watershed position with a 1.08 average. Burgers will help down lower ratings, as renewal has been called. Drink away Bob; you still lead the anemics! The Anemic's Delta dropped from a 0.85 to 0.80, as Making History's second showing lowered the bar beneath NBC's brownout, Powerless. The Middle of the Pack, much like society's Middle Class, is narrowing with time as uncertainty as success vs. failure is easier to define. ABC monopolizes the top shelf of the Winners Classification with 6 of 11 places, CBS continues to narrowly rule the Middle of the Pack with 4 of the 12-pack toward the front, and FOX collectively fails with 5 of the 9 positions vomiting an excess of failure in the Anemic classification. Amidst the Nielsen Delay Drama of 2017, CBS announced an order for The Big Bang Theory's prequel, tentatively titled Little Sheldon, which changed renewal percentages for three of CBS' nine sitcoms it offered this season. Given the predicted "post TBBT" plum scheduling, this increased survival predictions for Thursday staples TBBT and Life in Pieces. While conversely downgrading The Great Indoors due to recent performance disappointment (see below in Changes to Renewal Percentages). A power outage led a buzz worthy of a natural weather disaster, as delays in ratings performance not only delayed this article by two days, but left networks and ratings enthusiasts digesting its hangover. The 10-year, unstoppable demographic declines for network TV led common opinions to blame the data company for being "obsolete" in today's world. However, Nielsen is just that -- data minus network politics, critical praise or viewer opinions. The blackout left networks scheduling in limbo, as NBC took a bold stroke and replaced ailing Powerless with a rerun of yet-undetermined Trial and Error. Their gamble rewarded, as the rerun outranked Powerless' two weakest showings. Nielsen holds potential for other data measures, as only television stations rely on demos to attract advertisers. Alternative platforms such as CBS All Access do not care if you are 29 or 97; a subscription costs the same for both. So the next time the public wishes to deride Nielsen, remember the Nielsen Company does not perform scheduling. It reports it. The blame for outdated practices rests on the networks who take gambles like mixed cocktails. The latest debacle demonstrated the company is still relevant in 2017 as it was in 1992. Cheers to Nielsen by proving its value in absence. Two CBS shows entered this new echelon -- its strongest and weakest Thursday deliveries as dictated by Nielsen numbers. Little Sheldon's order bolstered certainty that CBS wants TBBT to stay a welcome guest for its Monday and Thursday helpings. This announcement, alone with an encouraging 48-episode renewal discussion, demonstrated CBS still depends on the network's oldest flavor to survive. As an added bonus, TBBT reruns continue to pull demos which best several sitcoms in the Winners' classification, creating two winners in one (still) anomaly of sitcom demos. Little Sheldon's declared void of canned laughter emphasizes the network is seeking change and forecasting its next era of shows. Enter Life in Pieces, which previously ranked at a 70-percent chance of renewal. This windfall of faith stems from LIP functioning minus canned laughter, a companion piece for Little Sheldon. Life in Pieces has 39 episodes aired, leaving 49 to go before CBS banks on lucrative syndication. Congratulations to both shows' pleasantly intoxicating victories, who are crucial for CBS' next two years of spirited wealth. TBBT's upgrade leaves a vacancy in this ranking, and minor complications as both remaining shows hit series lows this week. Proving Monday follows the current of Kevin Can Wait, Man With a Plan tied its series low just as its lead-in did. Reinforcing factors are scheduling compatibility with Kevin Can Wait, need for stability on Monday's inferior comedy block and never depending on freshman comedy lead-ins from TBBT. Factors working against are CBS' unlikeliness to renewal all four of its freshman comedies and failing to distinguish its ratings. Two more deliveries will decide if Man With a Plan gets a shot at a 100-proof upgrade. Modern Family delivered another series-low 1.9 rating, demonstrating the show is no longer the ratings nuclear-family it was during seasons 1-6 when it reached its zenith 6.1 rating during Season 3 in 2011. The cast is bloated, its leading gap between the next strongest sitcoms is narrowing, and the series low is a scant 30-percent of the show's glory days. It is aged in the same 8-year rum bottle with The Middle. But The Middle has its renewal label already ordered for packaging. Called "Tepid" when it debuted in 2009 with a 2.6 demo, the Middle reached its glass ceiling with a 3.2 demo in 2011. Since that height, it has lowered the liquid to a 1.4 demo at worst. The Middle's cocktail survived being moved to ABC's Tuesdaydrinking room, creating a strong franchise to expand ABC's spirits. Both shows are aged 8-years like fine Colombian Rum, and the Middle's liquid ratings are forecasting more nights of shelf life. Renewal is inches away from the barmaid at the network, and signs point to ABC granting MF another drink/season instead of cutting them off. 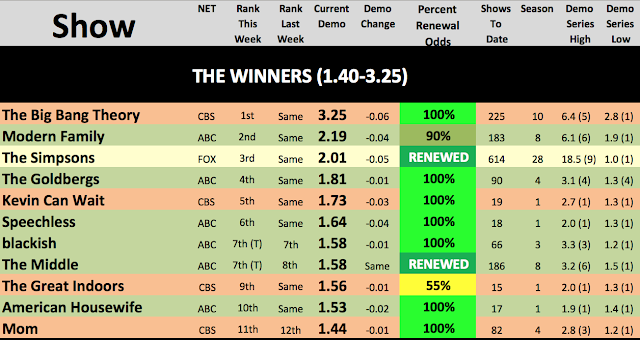 Last Man Standing tied its series low this week, and little has changed in its standing aside from now squatting in the Delta of "The Middle of the Pack." Last Man Standing will not leave this percentage as its fate will be revealed last. A CBS show was downgraded (see "Leans Likely Renewal"), and an Anemic Last Man on Earth earned a refill round of percentage faith after returning from hiatus, jumping from 55 to 80%. Delivering a 1.0 and 0.9, respectively, it keeps up with remaining FOX Sunday lineup. Recent duds Son of Zorn and Making History are stuck like gum under the bar counter, and 42 aired episodes leave LMOE 46 episodes away from FOX's Syndication Retirement Plan. LMOE has to prove itself for the season remains and hold its liquor against The Simpsons and Family Guy to maintain an 80% odd or improve its standing. Little changes to these three bar stools who keep up the same drinking habits with their neighbors, except Superior Donuts and New Girl hit series lows this week. Next week's ratings will determine if Superior Donuts maintains or downgrades, as its ratings have dropped on a downward trajectory like a fifth in a frat party. It may need the network to call a cab to determine if it will make it home to the Nielsen factory next season. Dr. Ken tied its series low, again, and that is all there is to discuss for ABC's bottom shelf variety. That, and the fact two sitcoms plunged below its 0.88 season average. Nielsen cannot provide more renewal spirits, as that glass sits clutched in the ABC executives' hands. The Great Indoors switched fortunes and percent categories with LMOE as not only did Little Sheldon's announcement forecast a demanded move, sadly without fail squandering TBBT's plum lead-in-again. Lowering the bar further is preceding Mom narrowly bested it in the ratings this week, showing limited growth potential. As mentioned above, it is unlikely CBS will renew all four of its Freshman comedies. Kevin Can Wait sets the Monday wave of ratings. Man With a Plan is its surfing companion, following the wave of liquid. And Superior Donuts has drank from CBS's less desired corner of the bar/schedule. No changes at this table, as both entries will be 86'd from the network's bar if space is needed. However, recent developments shine a beacon on our well-drink consumers. 2 Broke Girls delivered a paltry series low 1.1 on 3/13. Its finale is looming for early April, and the plot/pacing indicates no sign of a proper ending. CBS is famous for expecting proper goodbyes for its shows and would have called out a demanded last call to wrap up 2BG's drinking nights. Either CBS has a 9-22 episode order in mind for its outsourced patron, or TBS may pick the series up as its syndication remains successful. Son of Zorn ended its 13-episode run leaving its glass disappointingly empty. As it moved off its bar stool, Making History occupied the same seat and now rests in last place among the 32 sitcoms on network television. Upcoming performance will determine if Son of Zorn handles the Nielsen's spirits better, or if both will be bounced out of FOX's bar. Both entries in this corner of the bar have concluded partial deliveries after multiple seasons. They will be the next patrons 86'd if CBS and ABC need room for new patrons. Surviving graces are The Real O'Neal's need should ABC decide to expand two more spaces for sitcoms in its lineup. And CBS All Access may find The Odd Couple as a means to launch its first original sitcom delivery. NBC's Powerless burned out its Thursday lightbulb inside 5 episodes, lowering the bar to frightening levels and leaving the network to opt to air a repeat of the yet-rated Trial and Error in better faith. Powerless' glass is turned upside down, and its greatest hope is NBC allows it to stagger out the May Sweeps door airing out its remaining episodes. Two of the four patrons at this table have placed their Nielsen orders, albeit to disappointing concoctions. Making History aired its second episode on 3/12, dropping to a dismal 0.7 and now rests in the Delta/drain of the Anemic range with a 0.80 average. Trial and Error delivered a 1.4 and 1.0 shot respectively following ratings juggernaut This is Us' 3.4 demo. A disappointment indeed, but its prime lead-in differed in distillery. Superstore, Telenovela and The Good Place debuted behind juggernaut The Voice in the last two years, each receiving 11-13 episode orders. The results? Superstore utilized 1.8 and 1.4 ratings, Telenovela scored a 1.4 and 0.8, and the Good Place reached the liquid 2.3 mark for both showings. The later half-hour indicates the sitcoms' true weight minus the lead-in. Telenovela was cancelled, and the other referenced survived with critical acclaim. The problem is The Voice and This Is Us vary in distilled flavor. The Voice is an energetic Caribbean Rum, demonstrating the energy of the desired demo. This is Us is a distilled gin, somber and dry for the serious adults drinking this demographic. All sitcoms are a mixer of cola. Superstore, Telenovela and The Good Place proved compatible as cola to a cube libre of The Voice's power, while Trial and Error fought the dry dramatic tone. Dramas like Chicago Whatever are like Club Soda or Tonic to This Is Us' gin, proving to be a compatible mixer. Lessons to be learned, NBC, as you mixed a stank cocktail of scheduling tones. Promising factors for Trial and Error are it shifts back to mix it up with The Voice's energetic rum, so stronger ratings are not ruled out. And Trial and Error has already surpassed abysmal barmat Powerless, so upcoming weeks will see what percentage this mixer lands in. The remaining patrons have yet to sit at this table and will be discussed in April. Three existing shows are in a race to get CBS' last seat at its schedule/bar -- 2 Broke Girls, Superior Donuts and The Great Indoors. One of the three will likely drink again on another night next fall, and perhaps there will be two seats open on the schedule. But one will need to leave the establishment as CBS is at maximum occupancy in the comedy department. The race is on.